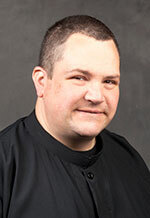 Dane DeDecker was clothed in the Benedictine habit at Saint Meinrad Archabbey in St. Meinrad on Aug. 5. He now begins a year of monastic formation, including study of the Rule of St. Benedict and monastic history. Novice Dane, 36, is from Geneseo, Ill. He studied for a year at St. Mary’s University of Minnesota in Winona. He was a member of St. Anthony Parish in Atkinson, Ill.
For the past 12 years, he worked as an over-the-road truck driver. As a novice, he will take a year off from formal studies and trades. The novitiate is a time of prayer and learning intended to help a novice discern his vocation as a monk.